SAMUEL JOSHUA composes for classical, sacred, and film genres. 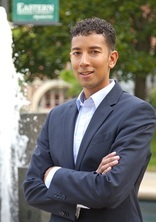 He earned his master‘s degree in composition at Eastern Michigan University under composer Anthony Iannaccone, and is currently pursuing his Doctorate in Composition at Michigan State University under composer Ricardo Lorenz. Samuel is director of music at Ann Arbor Baptist Church, and is co-founder of Gentle Praise, a sacred music publishing company. He is a member of the American Society of Composer, Authors and Publishers (ASCAP). I fell in love with your song Free this day performed by Linda Caswell. I have been looking for the lyrics with music so I can sing it at church but I’m unable to find anything. Thank you for allowing God into your life so we all can enjoy your wonderful gift.